Arizona Prison Watch: Hypocrites and Profiteers: AZ Regent Dennis DeConcini finally leaving CCA? Hypocrites and Profiteers: AZ Regent Dennis DeConcini finally leaving CCA? After two years of putting pressure on Dennis DeConcini to resign from private prison firm Corrections Corporation of America's board of directors, the American Friends Service Committee and other organizations behind the effort announced this morning that the former senator may have resigned. According to an AFSC press release, CCA filed a notification with the Securities Exchange Commission on April 3, "indicating that DeConcini is not on the company’s slate of nominees for Board of Directors for the coming year. The Board meets this Thursday, May 15th." At the beginning of the resignation campaign, DeConcini was a member of the Arizona Board of Regents (ABOR) and his law firm represented the Tucson Unified School District during the district's most contentious matters of late—the state's dismantling of the district's Mexican-American studies program and the district's ongoing 40-plus year desegregation case. The private prison industry is one of the driving forces behind the criminalization of migrants in this country. With its voracious appetite for profits, the private prison industry maximizes its profits by increasing the number of detainees while lowering costs, i.e., spending on detention—cheaper food, less highly skilled staff, fewer services. The private prison industry heavily lobbies federal and state decision-makers. A 2012 Associated Press investigation found that the three major private prison corporations spent roughly $45 million over the past decade to influence state and federal government. This money buys them not only contracts, but influence over policy at the state and national levels. CCA was closely linked to the passage of anti-immigrant legislation SB 1070 in Arizona. In addition, the for-profit prison industry operates a “revolving door” between the public and private sectors, hiring former legislators as lobbyists (or, in the case of DeConcini, board members) and placing its lobbyists (current or former) in positions of power in state and federal government. Until the launch of the FUERZA! campaign, DeConcini’s involvement with the private prison industry was relatively unknown. Since then, his name has frequently been linked with news coverage and discussion of the private prison industry. The FUERZA! 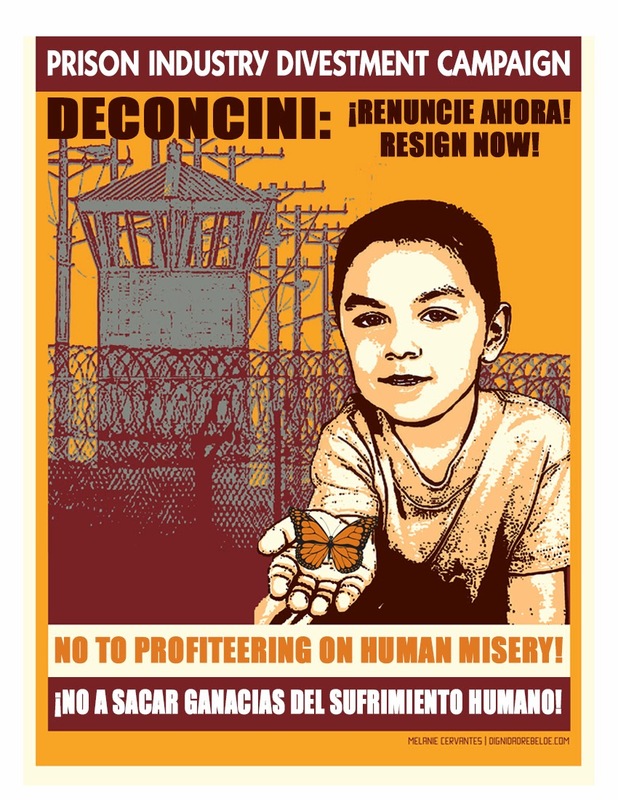 Coalition used a range of creative tactics to expose Senator DeConcini’s role in the industry behind criminalizing migrant families. Community members attended meetings of the Board of Regents, drawing attention to the heavy influence of the private prison sector on Arizona’s system of public universities. They utilized traditional and social media, public protests, and even a flashmob. FUERZA! members and parents attended a meeting of the Tucson Unified School District and called upon them to investigate the potential conflict caused by the DeConcini, Yetwin & Lacy law firm representing TUSD for over twenty years. Since funds for incarceration directly compete with funds for k-12 education from both the state and federal government, schools essentially have to “compete” with private prison companies for public dollars. The NAACP of Maricopa County filed an ethics complaint against the former Senator alleging a conflict of interest between his profiteering on incarceration and his representation of the interests of Arizona’s students as a member of ABOR. Over 1,000 community members and neighbors of Senator DeConcini mailed postcards asking him to resign. Senator DeConcini’s stepping down from the CCA Board remains a largely symbolic win, since he retains 17,105 shares valued at approximately $545,000, ensuring he continues to profit from the incarceration of family members from our community. Yet the message to elected officials and other community leaders is clear: affiliation with the for-profit prison and immigrant detention industry is deeply unpopular with the public and will not go unchallenged. This is particularly salient point for DeConcini, a Democrat who claims a track record on support for human rights and immigration reform. The community was particularly outraged to see a politician who would testify in congress against SB1070 one day and cash in on dividends generated by immigrant detention the next. DeConcini became the posterchild for politicians cashing in on this destructive industry. By highlighting his hypocrisy, FUERZA! exposed the crass profiteering on human misery that is the business model of not just CCA, but a host of other corporations, large and small. It revealed a local connection to a global industry, allowing immigrants and the community at large to connect the dots and see how their lives are directly impacted by the political and economic decisions being made and influenced by these companies and their political supporters.